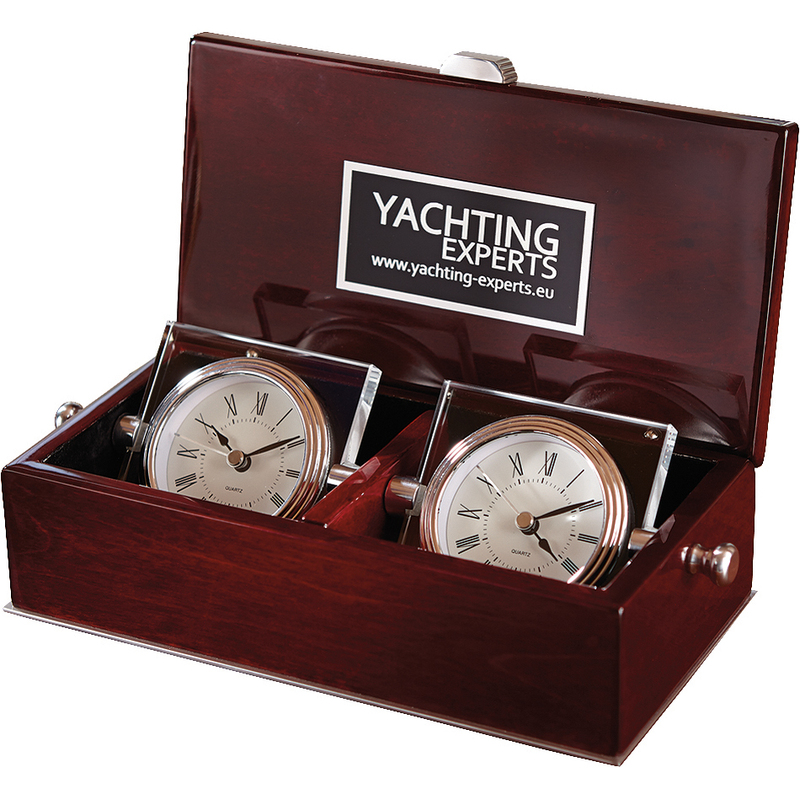 Product code: 15745 Category: Clocks & Watches. A beautiful gift to recognize top performing employee’s with. 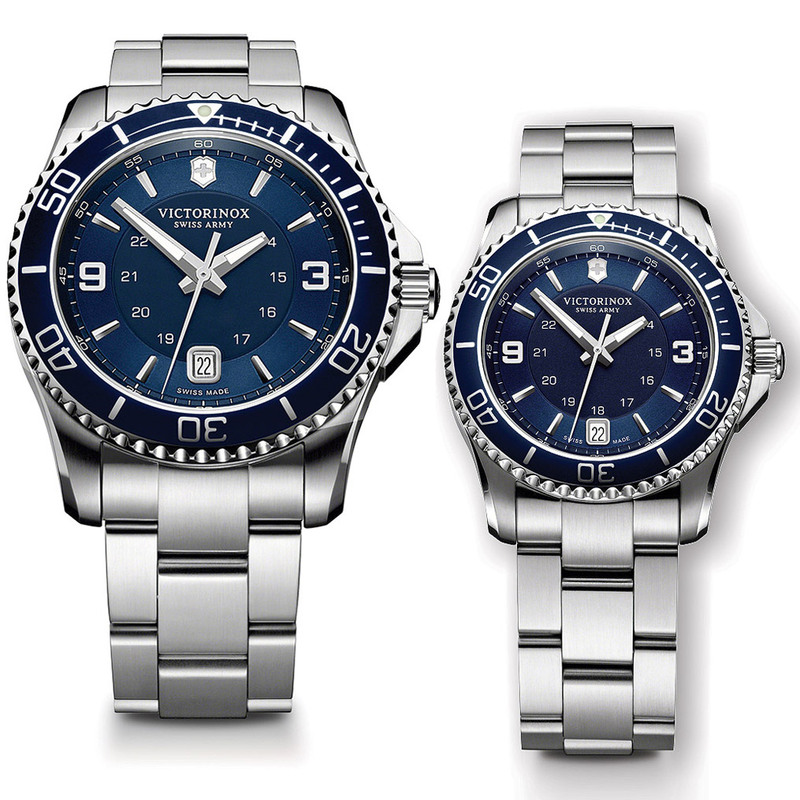 This Victorinox Swiss Army Maverick GS Watch is detailed with a blue dial and bezel and Stainless Steel bracelet. Setup Charges :$75.00 per location. Pricing includes laser engraving on one location of caseback* May vary according to product availability from supplier. ** Price subject to change without notice. Check the time, or check your teeth! This LED watch has a reflective face that doubles as a mirror. 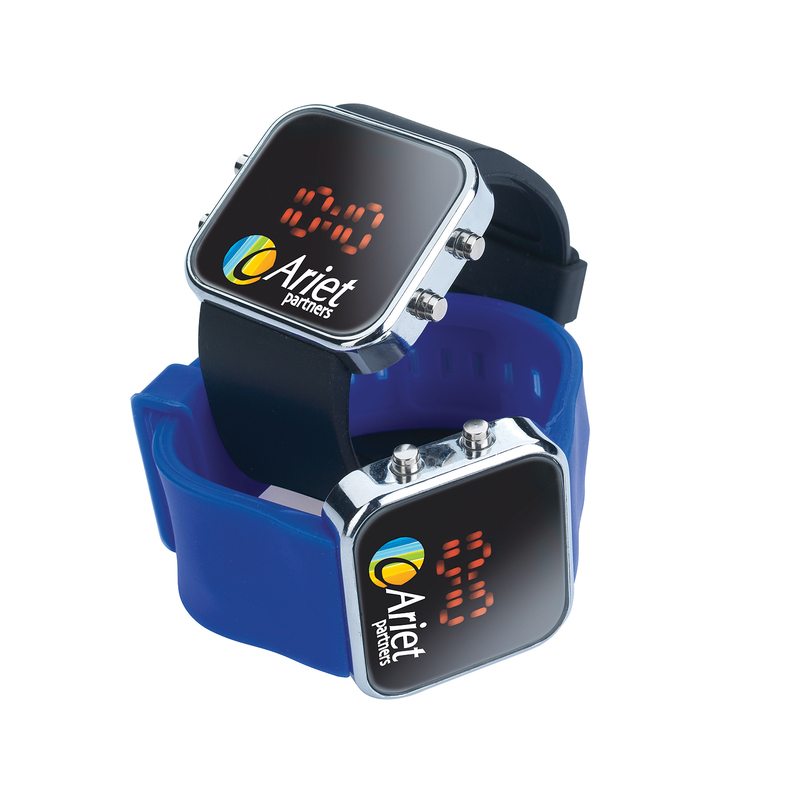 The digital timepiece features a flexible band, three display modes: time (hour and minute), date and seconds. The power saving LED will turn off in 3 seconds of non-use, when you want to check the time just press the side buttons to display numbers. Your choice of 12HR or 24 HR time. Made from Glass, Stainless Steel, Silicone and comes with instructions and an inserted button battery. 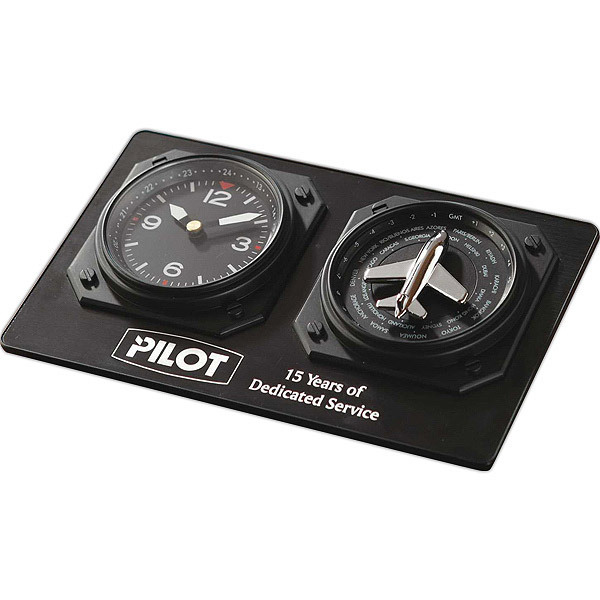 Great for the frequent flyer, this gift will be prominently displayed on the desktop! This auto-adjusting aviator clock makes a great desktop conversation piece. Just turn the plane to the desired time zone and the hands on the dial automatically adjust to the correct time. 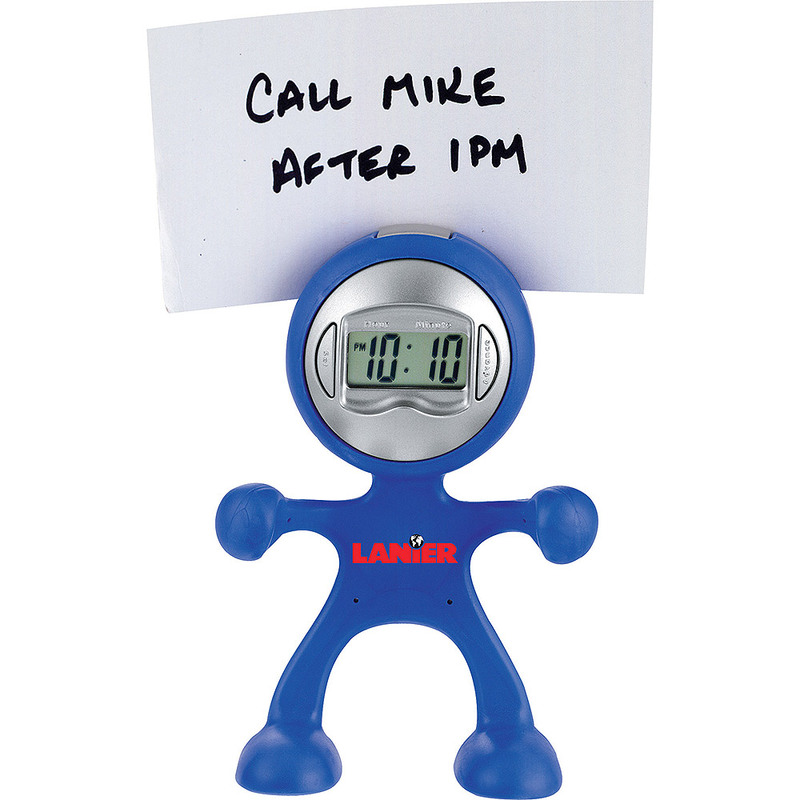 A fun addition to any desk, this digital clock displays time, date and seconds. It also features a pen and message holder and alarm. Button cell batteries are included. 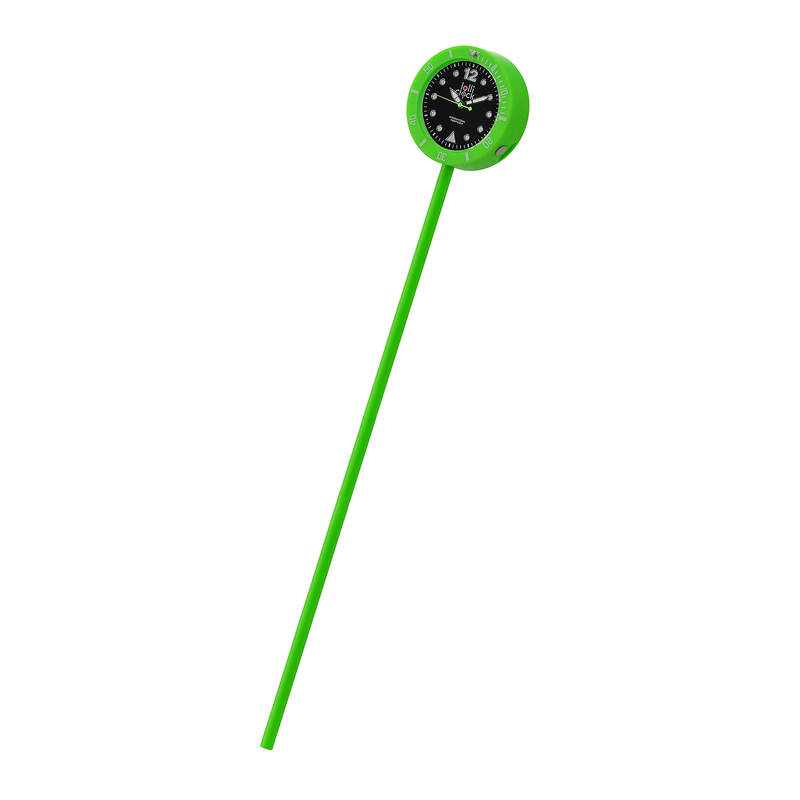 Whether you're drawing in crowds at your next tradeshow or handing out these unique clocks at your next sponsorship event, the Lolli Clock is a surefire way to get your company noticed! With a plastic ABS casing, this stick clock features 3 hands and a printed dial/UP relief index. The gift of time is the perfect gift for anyone who is the best at what they do! 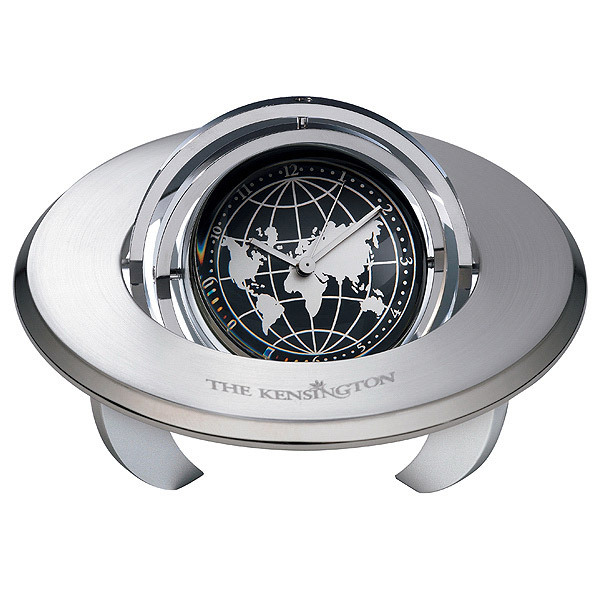 The unique globe design will remind any recipient that you think they are the best in the world. The analog clock features a picture frame for your favourite family photo; and rotates within a thick metal ring. This futuristic clock will be a unique addition to any desk. Frame holds a 7/8 inch diameter photo. 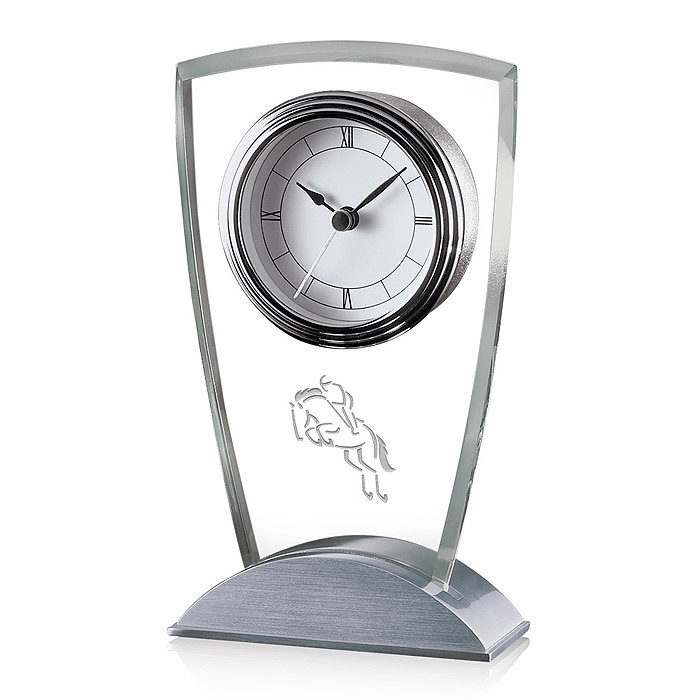 A tall unique shaped clock that is complete with a modern chrome face and a matching brushed aluminum base. It makes a wonderful gift or a stunning award. A beautiful way to express appreciation for employee performance. 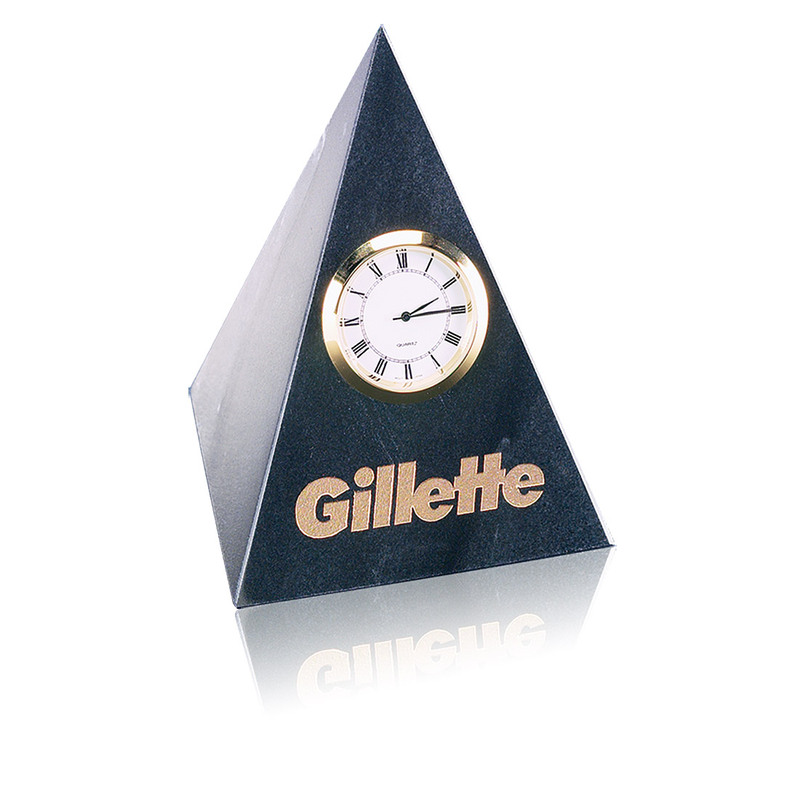 This pyramid shaped black marble clock is the perfect gift! Handmade from natural marble, it features a simple polished black marble inset with a gold-finished quartz clock. This beautiful time piece will recognize how much they are appreciated! 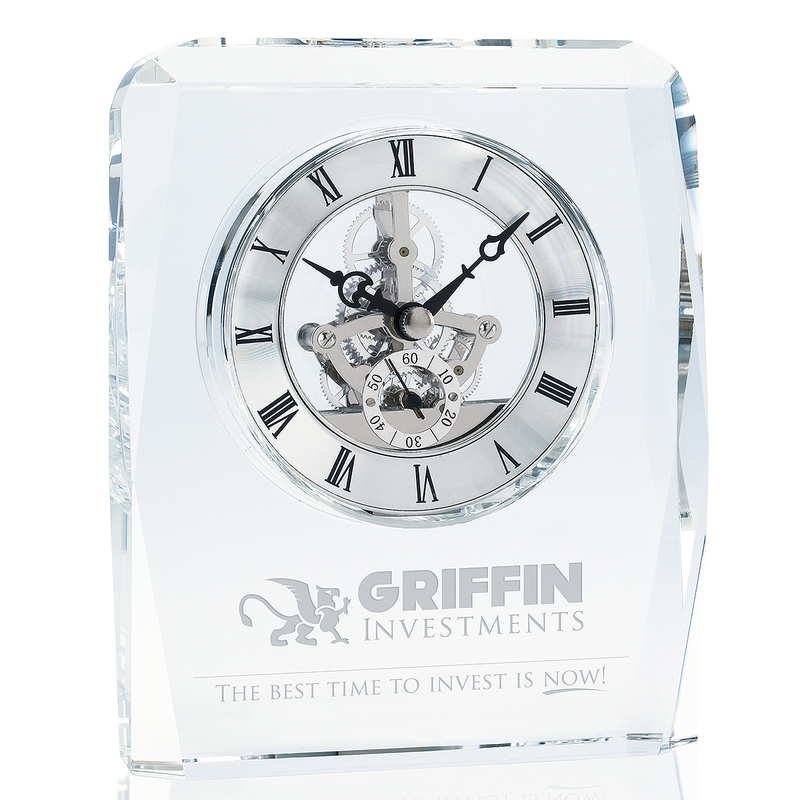 They will be proud to display the crystal skeleton clock on their desk. Includes 3 AAA batteries. Give a time-honored gift this holiday season! The Cornell desk clock combined highly polished rosewood with brass accents and deluxe quartz movement for a piece like no other. Elegant Roman numerals and a second hand complete the display. A handsome decoration for any setting, it makes an excellent gift or award. 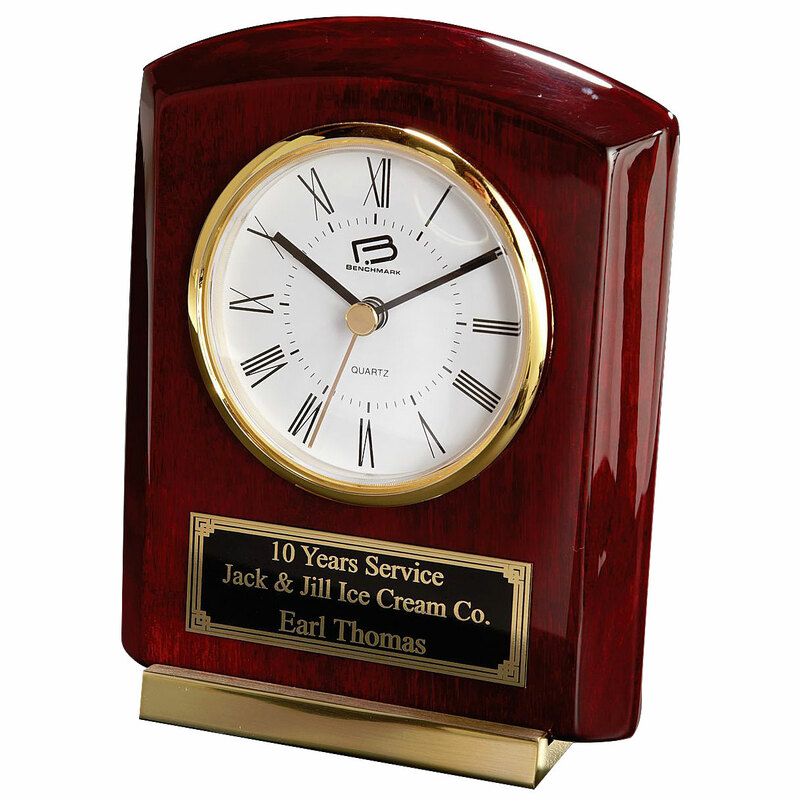 Recognize excellence with the Officer's Clock. Set in a beautiful wooden box, nothing beats piano finished Rosewood with silver accents. This exquisite pieces adds a touch of class, nostalgia and functionality to any environment.